It should come as a surprise to no one that Miami is all about boats. Even a broke schmuck could end up on a boat by the end of any day in Miami if he rubs enough elbows with some of the thousands of people who own cigarette boats, yachts, sailboats, and party barges in this town. So it makes sense that we would also host one of the greatest annual boat shows in the world. The Miami International Boat Show, which runs from February 14 to February 18 this year, brings in tons of boat enthusiasts from near and far, many of whom are looking to buy boats, sea craft, or accessories for their precious vessels. Beyond all this, these show-goers will need to play, eat, and sleep while they’re here in South Florida. What all this means is that the Miami International Boat Show is the perfect opportunity for any business, boat-related or not, to lure in these visitors and the collective millions of dollars they’ve set aside for their stays in Miami. How can you do this well? 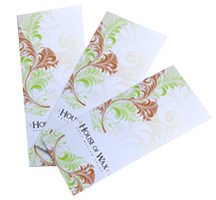 By creating targeted promotions and making use of custom-printed flyers and brochures. To all looking to print flyers and brochures in conjunction with the boat show this year, be aware: the convention for 2013 is an even better marketing opportunity than it was in past years because the February 14 start date combines the St. Valentine’s Day holiday with the boat show. This great coincidence means a few things for those thinking of printing flyers and other strategic marketing materials. First, you can bet many boat show goers will be willing to spend even more money than usual, since they’ll be looking to spoil their significant others during that week. Second, businesses that can boast a romantic aspect of their trade will be able to capitalize even more on the event if they print some high quality flyers to lure in boat show goers. Restaurants: print flyers offering a deal on lunch, breakfast, or dinner – maybe $5 off or a free dessert or drink with the purchase of a meal to anyone who brings the flyer into your restaurant. Free meals for kids and all-inclusive three-course meal deals are also enticing ideas. Do you offer catering services that you’re willing to bring to the deck of a ship? 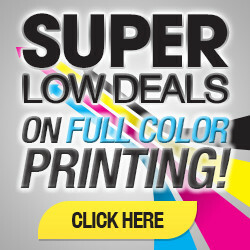 Let your audience know with some great full-color flyers. Gyms: Print flyers offering a three-day trial membership for a special price and hand them out outside the Miami Beach Convention Center, Miamarina at Bayside, and the Sea Isle Marina and Yachting Center or one of the many other hubs of International Boat Show-related events. This way, visitors who like to stay in shape can redeem their flyers to use your facility during their stay and pay you for the privilege. This will give your gym a revenue boost for the month. It is also a great way to rope in new locals who may become permanent members after their low-cost trial membership is up. Spas: Valentine’s Day is a great time to print flyers offering special 2-for-1 deals or 15 percent off of massages, facials, aromatherapy treatments, and other relaxing deals. After show-goers have been on their feet all day checking out boats and gear, they will welcome your flyer and the taste of relaxation it offers. And again, with the holiday, many people will be eager to do something romantic. Your strategically designed and distributed flyer or brochure will be just the thing to convince them to come in, especially if you offer them a special price. Nightclubs: The boat show will lure in plenty of guests from South Florida and beyond. Print some event flyers that will show them where to party while they’re here. Print flyers that double as vouchers for free entry before midnight or one free drink. Or, if your venue has booked some hot acts to coincide with the boat show, use your flyer as a platform to advertise that fact. 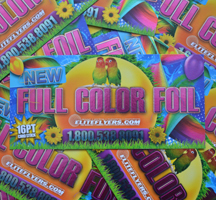 Try full-color foil printing for flyers that will really light up the night. Boat and fishing-related businesses: Obviously, the Miami International Boat Show is a spectacular opportunity to promote your marina, boat shop, or bait shop. Print special flyers advertising the lines you carry, and it’s never a bad idea to offer a special deal on one of your items or services. Boats for charter, boating accessories, boat tours, jet ski rentals, and many other water-related activities are the perfect offerings for you to print on your flyers. Hand your flyers and brochures out on the strip of hotels on Collins Avenue, or outside one of the venues mentioned above to ensure maximum reach.